Infineon to Bring Multiple Applications to Contactless Chip Cards: Public Transportation Services, Electronic Purse Systems and Identification. Infineon Technologies (FSE/NYSE:IFX) today introduced at Cartes 2002 show in Paris two new members of its my-C family of dual interface controllers and two new customer-specific dual interface controllers jointly developed with Sony Corporation (SNE). The security controllers will improve convenience for users of chip cards in applications, such as electronic tickets for public transport, electronic purses, banking cards, personal identification and access cards. The products are specifically designed for use in purely contactless as well as dual interface systems and support the contactless interface formats ISO/IEC 14443 type A, B, as well as Sony’s FeliCa(R). This makes Infineon the only manufacturer of chip cards’ integrated circuits (ICs) fully complying with these three interface formats which differ in their protocols for data transmission. 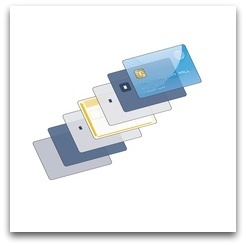 Contactless chip card technology offers numerous benefits in everyday life. It is more convenient to use in applications such as public transport, as commuters do not have to physically insert or closely swipe a card in front of a reader. The advantages of contactless chip card technology for transport service operators are reduced system costs and maintenance costs and the availability of on-route usage information. Travel pattern information allows the operator to optimize capacity and services. Furthermore, the operator is able to flexibly adapt services to meet the commuters’ needs, and to offer additional services, such as bonus schemes and best-price programs. The my-C products, the SLE66CLX320P and the SLE66CL80P, as well as the customer-specific products, the SLE66CLX320PS and the SLE66CL80PS, are fully compatible with Infineon’s proven 66Plus family of contact-based chip card controllers. This gives providers of operating systems the flexibility to port and extend their operating systems originally designed for contact-based chip card applications to contactless and dual-interface based applications. As required in electronic purse applications and in ID cards, the microcontrollers offer extensive security features. To meet requirements for the highest possible security, they combine multiple levels of physical protection, such as active shielding, and encryption support, including the industry’s strongest DPA/SPA (Differential Power Analysis/Simple Power Analysis) countermeasures. The on-chip Memory Management Unit (MMU) incorporates hardware firewalls to securely separate several applications. All security controllers support symmetric algorithms, such as DES (Data Encryption Standard) and Triple-DES. The SLE66CLX320P and the SLE66CLX320PS, which feature a powerful crypto-coprocessor with highest performance, also support asymmetric algorithms, such as RSA (Rivest, Shamir, Adleman) and elliptic curves algorithms. The SLE66CLX320P and the SLE66CLX320PS include 136 Kbytes of ROM for the operating system, 32 Kbytes of EEPROM for the application-specific software and data, 5 Kbytes of RAM for use as temporary computing buffer. The SLE66CL80P and the SLE66CL80PS offer 72 Kbytes of ROM, 8 Kbytes of EEPROM, 2.3 Kbytes of RAM. The 66CLX320P and the SLE66CL80P operate at a voltage range of 2.7 to 5.5 V and have a contactless multi-mode interface according to ISO/IEC (International Standards Organization/International Electrotechnical Commission) 14443 Type A and Type B, supporting communication speed of up to 424 Kbaud. Infineon produces these products in 0.22 micron process technology. Engineering samples of the SLE66CLX320P and the SLE66CLX320PS will be available in December 2002, of the SLE66CL80P and the SLE66CL80PS in March 2003. The products are shipped as sawn wafers or packaged in dual interface modules (M8.4) or purely contactless modules (MCC8). Further information on Infineon’s contactless product portfolio is available at www.infineon.com/security_and_chipcard_ics. Infineon Technologies AG, Munich, Germany, offers semiconductor and system solutions for applications in the wired and wireless communications markets, for security systems and smartcards, for the automotive and industrial sectors, as well as memory products. With a global presence, Infineon operates in the US from San Jose, CA, in the Asia-Pacific region from Singapore and in Japan from Tokyo. In the fiscal year 2001 (ending September), the company achieved sales of Euro 5.67 billion with about 33,800 employees worldwide. Infineon is listed on the DAX index of the Frankfurt Stock Exchange and on the New York Stock Exchange (ticker symbol: IFX). Further information is available at www.infineon.com. Infineon and the stylized Infineon Technologies design are registered trademarks and service marks of Infineon Technologies AG. Other product and brand names may be trademarks or registered trademarks of their respective owners. This news release is available online at www.infineon.com/news.